Honoring Choices Pacific Northwest’s vision is for everyone in Washington state to receive care that honors personal values and goals at the end of life. To accomplish this, Honoring Choices Pacific Northwest will launch a multi-year, statewide initiative providing training and resources to hospitals and doctors so they are prepared to discuss and honor their patients’ wishes. First Choice Health is the first Platinum level sponsor to join the initiative, with a contribution of $300,000 over three years. Premera Blue Cross is the first Gold level sponsor, with a contribution of $50,000. These contributions ignited the ability to take the next steps with preparation, including having a key note speaker from Gundersen Health present at the upcoming Partners in Quality: CEO and CMO Leadership Forum about the Respecting Choices® First Steps® program. We continue to seek financial sponsorship, identify early adopters, develop supporting materials and create a leadership structure to ensure sustainability. For more information, please contact tanyac@wsha.org or jessica@wsma.org. Honoring Choices Pacific Northwest just released a comprehensive new website designed to help people create end-of-life care plans and guide them through sharing those plans with loved ones and health care providers. The resources and tools on the website are free and available to anyone. Health care professionals can also find valuable resources on the site and participate in trainings to prepare them for conversations around end-of-life care, recording patient wishes and ultimately honoring those choices. Please take a moment to review the web site, add it to your favorites and spread the word! Work has already begun for Phase II of the website, which will include a list of advance care planning resources in each county. For more information or to get involved, please contact tanyac@wsha.org or jessica@wsma.org. A Washington state study measuring the use of medical tests and procedures included in recommendations from the national Choosing Wisely® campaign clearly shows overuse of some tests, as well variation in use between counties. 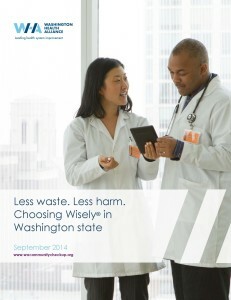 The report, Less Waste, Less Harm: Choosing Wisely in Washington State, offers county-by-county results for nine different Choosing Wisely recommendations. The results are based upon claims data representing 3.3 million individuals in Washington state and was issued this week by the Washington Health Alliance in conjunction with the Washington State Choosing Wisely Task Force, a group of more than 20 medical leaders from health care organizations in the state. The task force is co-sponsored by the Alliance, the WSMA and the WSHA. Overuse exists. Patients may be getting unnecessary care that costs money and could potentially put them at risk. Variation exists. Often the rates between the lowest and highest performing counties vary by more than twofold. Where you live and the type of insurance you have (commercial vs. Medicaid) may influence the type of treatment you receive. 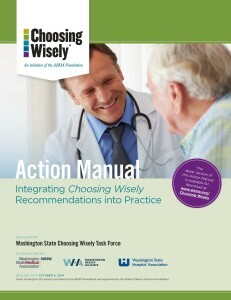 The report provides a useful look at how some of the Choosing Wisely recommendations are being utilized by physicians and patients in Washington state. 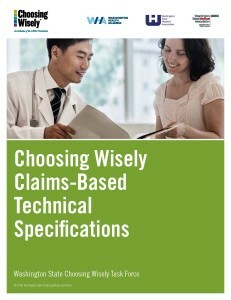 It encourages clinics and hospital systems to continue integrating Choosing Wisely within their organizations and for physicians and patients to consider the recommendations at the time of care. To support physicians seeking to integrate Choosing Wisely recommendations into their practices, the task force has developed the Choosing Wisely Action Manual that outlines eight steps for leading change that include developing a change vision and generating short-term wins. Looking ahead, the Washington State Choosing Wisely Task Force has set out to work on the following projects in 2015: operationalize “Change One Thing,” hold a Choosing Wisely Summit, continue to work on clinical and claims data, engage consumers, and develop communication skill-building training. 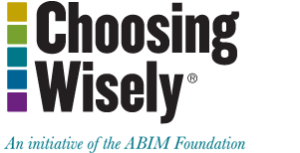 If you’d like more information about how to integrate Choosing Wisely into your organization, please email Jessica@wsma.org or TanyaC@wsha.org. Studies indicate repeated exposure to computed tomography (CT) scans is increasing the incidence of cancer in adults and children. Reducing and/or removing the instances of unnecessary radiation, reduces future cancer risk from direct medical radiation exposure. The Washington State Hospital Association (WSHA) as a participant of the Centers of Medicare & Medicaid Services Leading Edge Advanced Practice Topics (LEAPT) piloted reduction in radiation dose and reduction in unnecessary studies. The hospitals and health systems that participated in the LEAPT Reduction in Undue Radiation project implemented strategiesto reduce the dose per scan in head CTs and tools to guide decision making for CTs with pediatric head trauma and appendicitis. The LEAPT hospitals had an 8% reduction in the average dose per adult head CT and a 9% reduction in the average dose per child head CT.
WSHA will continue this work through Washington 100K Children Campaign to maximize the long-term health of our children by ensuring safe imaging in health care. Eliminating overuse of imaging procedures results in better care, better health, and lower health care costs. WSHA will lead Washington on a journey to reduce radiation exposure in children in collaboration with the national 100K Children Campaign and Dr. James Duncan of St. Louis Children’s Hospital Radiology and the Mallinckrodt Institute. We will be monitoring dose length produce for head CTs, the percentage of single phase head and chest studies, percentage of ultrasound for appendicitis, and percentage of observation ordered instead of head CT for minor head trauma in children. Please commit to safer imaging for children by joining our 100 Children Campaign. Please visit our 100K Children Campaign website to see our Toolkit, Measures, and Resources. The Governor-appointed Performance Measures Coordinating Committee approved a statewide core measure set on December 17, 2014. The measures address topic areas related to prevention, acute care, chronic care, health care cost and population health. These measures will ultimately inform statewide purchasing, cost benchmarking and quality improvement. The development of a statewide core set of measures was established under the state’s health care transformation effort as part of ESHB 2572 . WSHA staff represented hospitals on the Committee and on the three technical workgroups who reviewed and recommended measures. WSHA will continue to work with stakeholders on how to best implement these measures and update the core set priorities and evidence changes. For background information, refer to the July 11 WSHA Bulletin or contact Ian Corbridge at ianc@wsha.org. In partnership with the University of Washington Graduate Programs in Health Administration, and UW Professional and Continuing Education, the WSMA is offering a 40+ hour hybrid-distance leadership skills-development course. The course combines face-to-face and online learning to enable course participants to begin developing and honing their leadership skills at their convenience. Click here for a detailed curriculum. The spring 2015 course will be held March 6 – May 8. The in-person classes will be held Friday and Saturday, March 6 and 7 in Spokane. Course participants will then have eight weeks of online instruction and interaction, finishing with a third in-person session on Friday, May 8, also in Spokane. Presentation of your capstone project on the final day is required as assessment for the online portion of the course. The course is limited to 30 participants. Individuals or group/system teams are encouraged to apply. The tuition for the course is $2000 for WSMA members and $2550 for non-members. A 5 percent discount is offered for groups of five or more. This activity has been approved for AMA PRA Category 1 Credit™. If you are interested in the course or have a physician(s) or physician assistant(s) in your organization you would like to nominate for the spring 2015 course, please submit a cover letter outlining the applicant’s interest in the course and goals they hope to accomplish, a CV and a letter of recommendation by Friday, Jan. 30 to Lynda Sue Welch at lyndasue@wsma.org or to the WSMA Seattle office: Attn: Lynda Sue Welch, 2001 6th Ave, Suite 2700, Seattle, WA 98121. If you have any questions about the WSMA/UW Physician Leadership Course, please contact Lynda Sue Welch at (206) 956-3622 or lyndasue@wsma.org. Leadership skills are essential for physicians regardless of practice setting—and were not necessarily taught in medical. This conference is one of our most popular meetings. Sessions are highly interactive and enable physicians to walk away with concrete ideas and skills that can be put to immediate use. The 2015 WSMA Annual Leadership Development Conference will be held May 15-16 at Campbell’s Resort at Lake Chelan. Visit: www.wsma.org/LDC for the latest information. The WSMA, in collaboration with American College of Physician Executives, is offering members access to a variety of ACPE online leadership skills-development courses at a discounted rate. WSMA members receive access to these courses at the ACPE member rate—plus an exclusive 20 percent discount. These activities have been approved for AMA PRA Category 1 Credit™. The self-study courses are taken and completed at your convenience. They do not require a scheduled date. Once purchased, you can access the course as often as you’d like until June 1, 2015. For more information about the WSMA’s leadership development opportunities, please contact Jessica Martinson, WSMA’s director of clinical education and professional development, at jessica@wsma.org. Read patient tips related to the measure they’re interested in. Watch the 4-minutes video about the new web site and how it works. WSHA has long been committed to transparency as a way forward; we are excited to be able to show the public what kind of information is available to them, and how they can use it to improve their own hospital experience. We anticipate this will elicit questions from patients to discuss with their doctors. Being prepared for those conversations about quality scores is something physicians will need to be ready to discuss. Prepared for Ebola patients, but what about influenza? The Centers for Disease Control (CDC) has been front and center with ensuring updates are presented on the latest guidelines for hospital and ambulatory readiness should a known or suspect Ebola patient arrive in the U.S. These updates are posted on the CDC web site and the WSHA Ebola web page. Most recently, the CDC has provided guidance on for EMS providers and a flyer for Ambulatory assessment, including a Top Ten Things You Should Know about Ebola, public safety flyer. There have been four confirmed cases in the U.S., with one death. No new cases have commenced in 2015. The Washington Department of Health has been effective in communicating and working with hospitals, clinicians and other state entities, such as Washington State Hospital Association and Washington State Nursing Association. Ensuring hand hygiene and flu precaution efforts continues to be a high priority for hospitals during this time of year. So, be knowledgeable about your hospital preparedness for a potential Ebola patient, but be ready for influenza. The Washington State Department of Health is working to provide education and outreach on an important patient safety program and is looking for opportunities to spread the message. Prescription drug abuse and misuse is a national and local problem. After an eight-fold increase in the prior decade, the prescription overdose rate in Washington state declined by 29 percent between 2008 and 2013. The decline in deaths due to a prescription-drug overdose seems to be leveling off — there were 381 of these deaths reported in 2013, only seven less than from 2012 (for more details you can view the Nov. 17 DOH press release). While the news is promising, there is still much to be done to further address this problem. One way Washington state is working to address prescription drug abuse is through the Department of Health’s Prescription Monitoring Program. The PMP is designed to promote patient care and prevent prescription drug misuse by allowing providers to review the controlled substance history of patients they are treating. The data can be very valuable for preventing duplicative prescribing, identifying overdose risk or addiction, coordinating care and assisting in compliance with pain management agreements. PMP is offering to provide information or presentations to your organization’s health care professionals with or without continuing medical education credit. PMP Director Chris Baumgartner reports, “The training will show you how to streamline controlled medication reports into your workflow and generate a thoughtful care plan, and will explain how your office staff can facilitate the process.” Training will be provided by either the PMP director or the DOH operations manager and may include insight from a medical provider who regularly uses the program. The PMP system itself is free for providers to use and can be critical for patient care and safety and for protecting your practice. If you would like to discuss hosting this presentation at your organization, please contact Chris Baumgartner, PMP director, at chris.baumgartner@doh.wa.gov or (360) 236-4806.